Enjoy an exclusive look at St. Augustine's art galleries while sampling culinary delights on this St. Augustine walking tour. City Walks offers an exclusive VIP Gallery Art Stroll & Tasting Tour on the third Friday of the month in 2018. The 2.5-hour tour departs at 4:30 p.m. from the City Walks offices at 4 Granada Street. 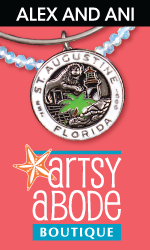 Guests on the tour will learn how St. Augustine’s art, architecture and culture combine to create the unique atmosphere and charm of the nation’s oldest city. The tour takes participants to several different galleries, where each gallery’s curator meets the group and discusses select art displays. This tour also includes several culinary tasting stops for wine and light tapas. St. Augustine City Walks Tours is St. Augustine’s premier historic walking tour provider, with a variety of tours to choose from, including culinary tours, ghost tours, and specialty tours (including a monthly free pet-friendly “pup crawl”). They also offer custom group tour packages including local attractions & tours, events, accommodations, group dining transportation, entertainment and much more. Admission: $25 per person. Please call (904) 825-0087 or visit here to make reservations. When: The VIP Gallery Art Stroll & Tasting Tour departs at 4:30 p.m. on the third Friday of the month in 2018. Where: The tour departs from the offices of City Walks and Tour St. Augustine at 4 Granada St. in the heart of St. Augustine’s historic district.